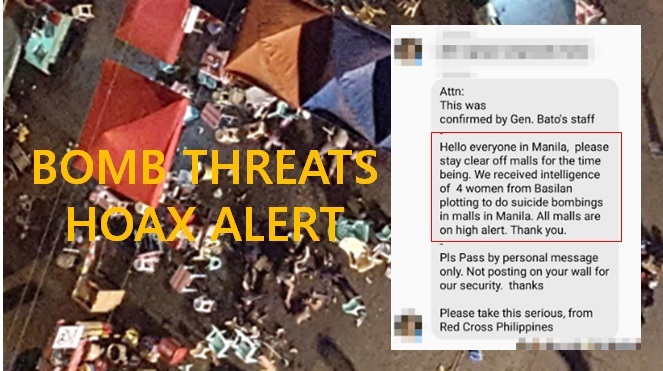 MANILA, Philippines – Bomb threat posts, alleged ‘next target’ and warnings spread throughout social media and even on text messages after the tragic bombing at Davao City night market that killed 14 and injured 67 civilians on Friday, September 2. Meanwhile, various forwarded text messages and social media posts went viral claiming the “next target” will be plotted into major cities. Facebook page, “PCU Meme” posted yesterday, September 4, the possible next bomb target. The post quickly caught attention and instilled scare to the netizens. 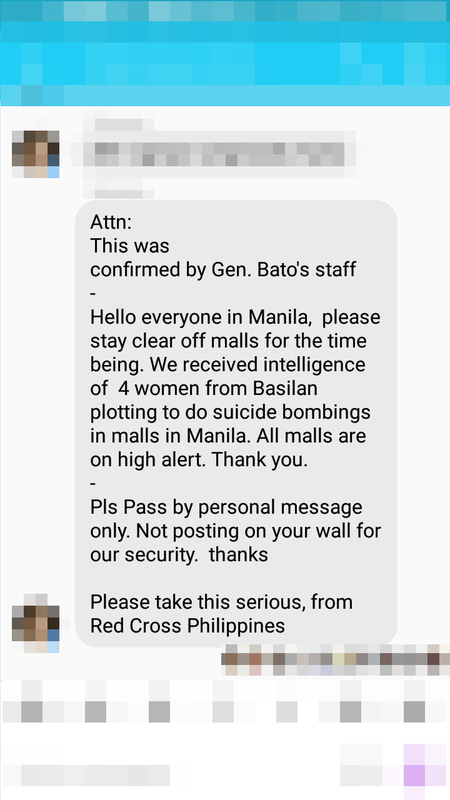 According to the post, an intelligence report was allegedly received and confirmed by one of PNP Gen. Ronaldo “Bato” Dela Rosa’s staff saying that 4 women from Basilan was plotting suicide bombings in malls in Manila. Also, chain of text messages were received by some informing the public about a bomb threat due in malls in Manila too. Similar as the viral bomb threat post spreading on social media. This time, the information was allegedly from the Philippine Red Cross. Philippine Red Cross (PRC) immediately released an official statement through their Facebook page. According to their statement, the NGO is denying any such text messages, private message via Facebook and any other social media platforms cautioning the public not to go into malls due to a bomb threat. “...Official statements or advisories from the PRC will only come from the Chairman and/or Secretary General. PRC does not issue security advisories as such can come only from the national government, particularly the security offices…” stated in PRC’s post. Another hoax bomb threat recently went viral as another Facebook page “Cebu Flash Report” posted an alleged bomb threat information with the same message as all of the above mentioned; this time, the “bombing” will take place in Cebu. 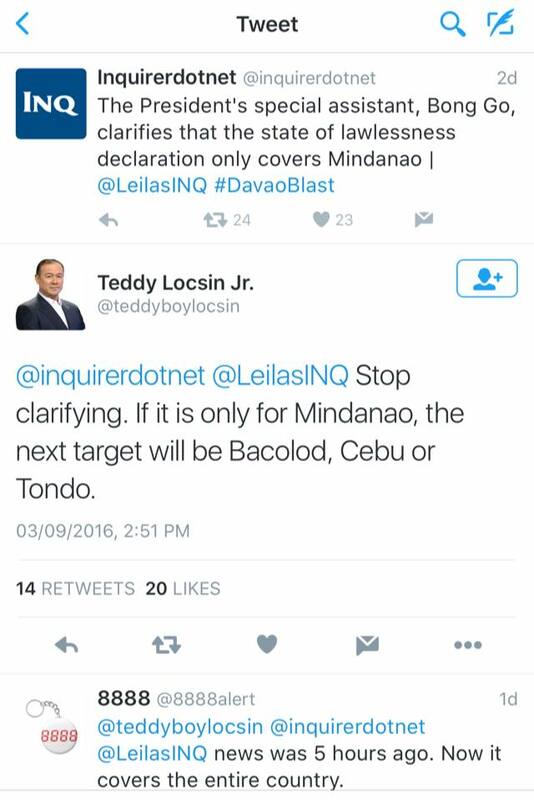 The post was then revealed hoax when a netizen commented the original tweet wherein Locsin answered Inquirer’s post. Just this morning, 4 schools near Malacañang Palace suspended their classes due to supposed hoax bomb threat. By 9 a.m., all schools were declared safe. As of press time, the government is yet to release official statement regarding these hoax threats.